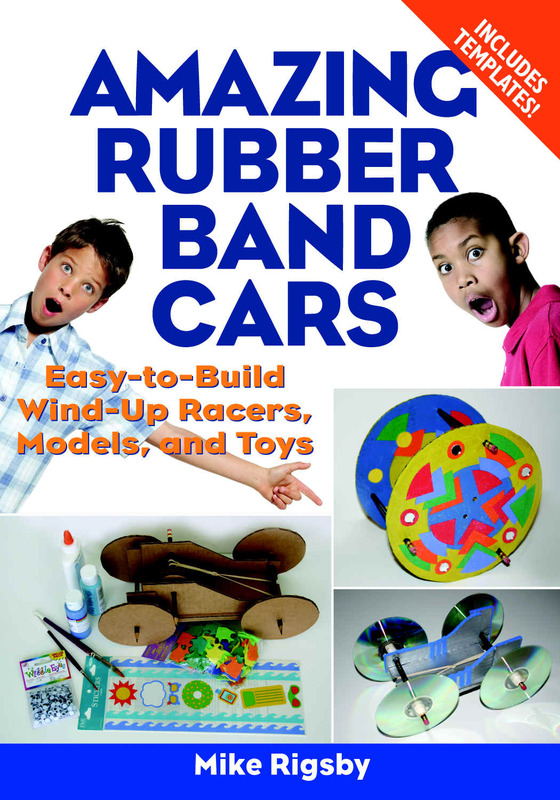 Kathy’s college roommate’s, Annelle’s, husband, Mike, has published a book: Amazing Rubber Band Cars. During the past week I’ve been building one of the cars – a big one. More information to follow when time permits. 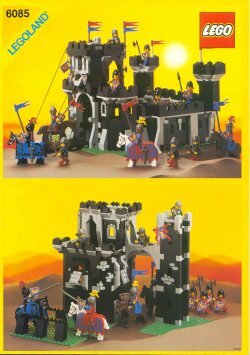 I sorted, and inventoried the 6085 Black Monarch’s Castle. Image courtesy of brickset.comThanks to peeron.com for the inventory list. I am missing a number of parts for this kit. So I have ordered a few of them to try out the Brick Link site and one of the vendor there named Pooh’s Corner. 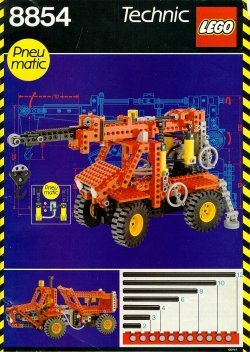 Today finally I won the bid on a Lego Mindstorm NXT robotic system on eBay. I’ve been trying to get one for the past few weeks, but have been over bid time and again. I week or so ago I bought a MiniPOV3 from Make magazine, Makezine. 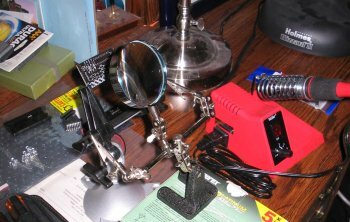 Yesterday I purchased a Weller WLC100 soldering iron, a Panavise Jr Model 201, a Z-TECH Helping Hands with Magnifier Model 53-003, some 60/40 rosin core solder and 5 ft. of .075 inch solder wick from Frys electronics. MiniPOV3 circuit board in vise.Today after doing some yard work, I put together my MiniPOV3 using the MiniPOV Instructables. I switched it on and it worked the first time. Neat. Next I downloaded the WinAVR development system. I attached the MinPOV3 to the serial port of my computer and reprogrammed it to say “I Love Kathy!”. Neat again. My plan is to learn more about the ATtiny2313V-10PU. Well I’m trying to keep myself busier on weekends. I did my 7 mile morning run with my running class. I ran with a good crowd including Chris, Jay, Robert, Celeste, and Glenn. We chatted all the way which was nice. This class and my running continues until next February’s Austin Marathon. Wish me luck. I need it. After arriving home I cleaned-up and then I added 1GB of RDRAM to my son Matthew’s old Dell Dimension 8100. I had purchased this memory on e-Bay last week. The memory was not cheap, but the machine is a 1.3 GHz Pentium 4 which is better than my old 800 MHz AMD Athlon that I had disk nuked a week or so ago. Next I installed Linux Fedora 7 on it, and I installed some work things (Cell Broadband Engine Software Development Kit) on it too. Now it’s ready to go and with the additional memory the machine is quite snappy so it was a worthwhile purchase. I again continued to reduce Lego entropy. 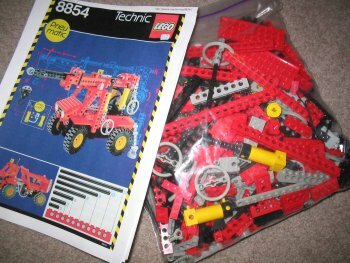 Earlier this week I sorted, and inventoried the 8854 Power Crane. Image courtesy of brickset.comThanks to peeron.com for the inventory list. 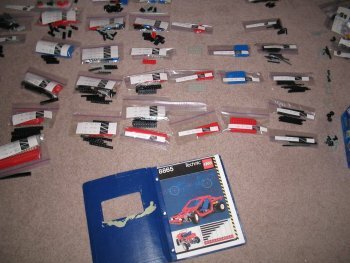 I printed out a copy of the inventory and cut it up it into strips contains a related group of parts. For each group I put the cut up strip into a snack-size baggie, found and counted the parts into the baggie, and put the now filled and sealed baggie into a larger gallon-size baggie. For this kit I am missing only three parts. Now the question is: where can I get them? 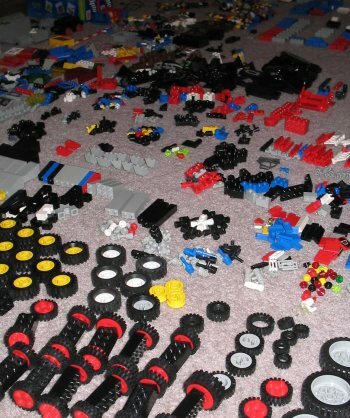 Then I sorted the hundreds of miscellaneous parts (non-blocks or plates) into groups and put them into baggies. I really need several containers with little divided sections. 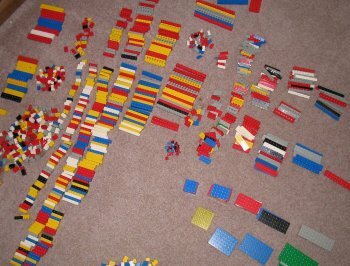 I decided to sort three banker boxes of Lego blocks this weekend. These blocks were given to our children and had collected over the years. When they left home we bundled them up, and put them in the garage. Overall I consider this job a way to reduce the randomness of the “system”, that is, to reduce the entropy of the hundreds of mixed pieces into a more organized system. Based upon thermodynamics it always takes more energy to accomplish. Well it has been hours and I’m still doing it. So it sure has taken a lot of my energy and I’m still not done. Over the past few years I’ve been collecting old computers. Some have been mine and others have been my children’s. They have now gotten to a critical mass of four and I think it’s time to get rid of some of them. 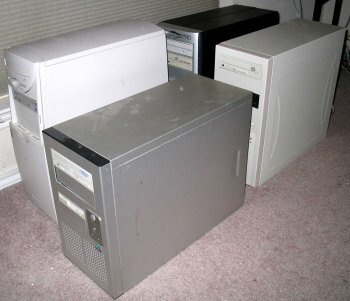 Left to right: my cream-colored Gateway 300Mhz, Justin’s silver homebuilt from his college days, Matthew’s black Dell Dimension 8100 from his college days, my cream-colored homebuilt 800Mhz AMD AthlonI’ve selected one (Matthew’s old desktop machine) to be my next Linux system (previously I was using my Athlon machine). However, Matthew’s machine only has 128MB of memory and is seriously strapped performance-wise because of it – for example, no X-windows. Yet it’s the best of the bunch since it has a 1.3GHz Pentium 4. The downside is that it requires PC800 RDRAM memory which is expensive. While doing other things I’ve been sitting on eBay today bidding on 1GB (2x512MB sticks) of memory for it. Now I have to get rid of the the other three junk machines. So today I’m also sitting here running Darik’s Boot and Nuke program from a CD on the Athlon machine. Running this program is not just a simple minute or two process. So far a 40GB drive took about 3 hours whereas two 20GB drives took about an hour each. Right now I have started a 20GB drive, and have a 30 GB and a 6GB still to do. You have got to have patience doing this. We spent the last two days in Wimberley, Texas at the Creekhaven Bed and Breakfast. We ate, watched DVDs in bed, shopped, slept in, and ate some more. Breakfast was a buffet each morning, and Sunday’s french toast was especially great (done as a casserole). Also this was the first Saturday of the month, so that meant it was Market Days in Wimberley. We spent a few hours there touring the hundreds of booths, but we were good and didn’t buy much “stuff”. Kathy got some small stitched pieces, and I bought a DVD. It was so nice to just spend a few days together, just us. You are currently browsing the Watt's Up blog archives for September, 2007.